"I will never forget that day that our life was changed. Some for the worse and some for the better," says Cody's mother, Tracy. 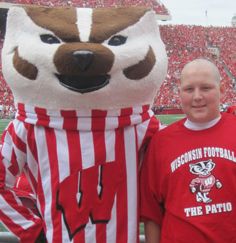 Fifteen year old Cody was the typical teenage boy who loved hanging with friends, going to school and cheering for the Wisconsin Badgers football team. Life seemed pretty good until he was suddenly diagnosed with Acute Lymphoblastic Leukemia. "I will never forget that day that our life was changed. Some for the worse and some for the better," says Cody's mother, Tracy. Once the diagnosis was confirmed, Cody began treatment straight away. He was put on a specific cancer-fighting drug that his body could not flush out, resulting in distress to his kidneys. As a mother, Tracy did whatever she could to provide for her family and make ends meet. She held two jobs - as a waitress and running an in-home daycare center but had to shut down the daycare to focus on her son's health. She picked up extra shifts at the restaurant then she received word the restaurant burnt down. Tracy went from being a hard-working mother taking care of Cody and her other children to having no source of income. That's when The National Children's Cancer Society stepped in. While Tracy was focusing on her family and unemployment, the NCCS provided the family with money for meals and gas. "I could not have even come close to keeping my head above water if it wasn't for the NCCS," she said.